Our LS3/5a V2 featured at the 2015 Poland Audio/Video show in Warsaw, Europe’s second biggest high-end show. www.6moons.com determined it was the third best sounding room. See their review page here. Full-resolution images are now available online - see the relevant Gallery pages for links. Product Brochures/Instruction Sheets are now available online - see the relevant Product pages for links. Built under license from the BBC, the Stirling Broadcast LS3/5A V2 represents our first design collaboration with Derek Hughes. Derek drew on his extensive experience of the LS3/5A which reaches back to his work for the BBC in the 1970s. He has achieved something very special by retaining the legendary sonic character of the original, capturing the much loved vocal abilities of the classic 15 ohm version, whilst combining this with the faster more modern sound of the newer 11 ohm. As a result the V2 has improved and extended bass response with greater handling of dynamics. 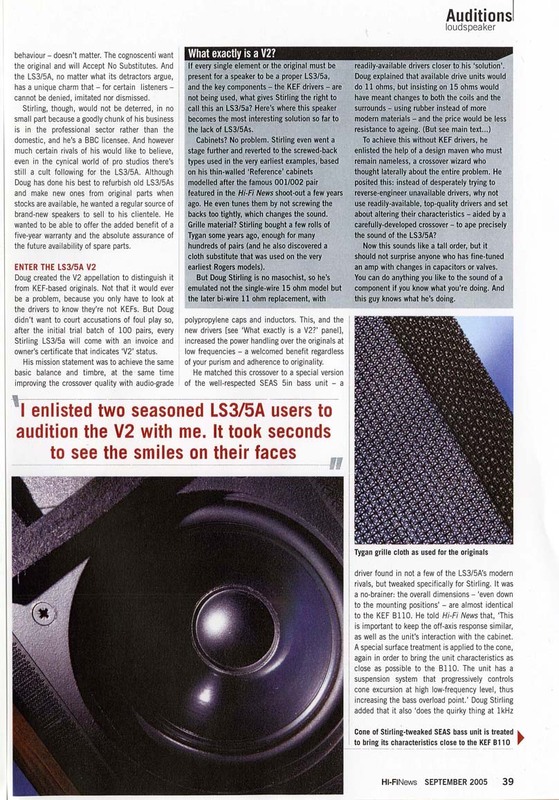 Mass-produced versions of the LS3/5A used a compromised cabinet with 12mm walls and a glued rear panel. In contrast the Stirling LS3/5A V2 cabinets have screwed-on front and rear panels and so are faithful to the “lossy” cabinet design philosophy developed by BBC Research Department at Kingswood Warren. The Stirling LS3/5A V2 is modelled on the famous 001/002 pair featured in Hi Fi News which were built in-house by the BBC and used as their references. The V2 combines the very best of the traditional BBC LS3/5A with a modern design by using custom high quality drive units in thin wall (9mm) birch plywood cabinets, damped using double layers of bituminous pads. The high-quality crossover followed extensive development with both computer aided design and traditional A-B listening used to voice the Stirling LS3/5A V2 against BBC 001/002. The V2 comes with a 5 year warranty and the assurance of the future availability of spare parts. 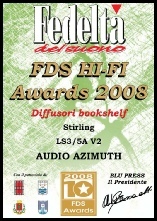 “I was very impressed by the Stirling LS3/5a V2, … it both lives up to the reputation of its illustrious ancestor and even, perhaps, improves on what the original LS3/5a had to offer.” - John Atkinson - Stereophile April 2007. “The Stirlings are proud descendants of their royal lineage - the tactile midrange, the projected presence, the warm upper bass, the stellar imaging, the deceptively large presentation - they’re all back.” - Paul Seydor - The Absolute Sound Dec 2008. “I enlisted two seasoned LS3/5a users to audition the V2 with me. It took seconds to see the smiles on their faces.” - Ken Kessler - HiFi News Sep 2005. The Product Brochure for the V2 can be found here and the Installation and Care Instructions can be found here. All brochures and instructions can be found here.